Vacation rental house. 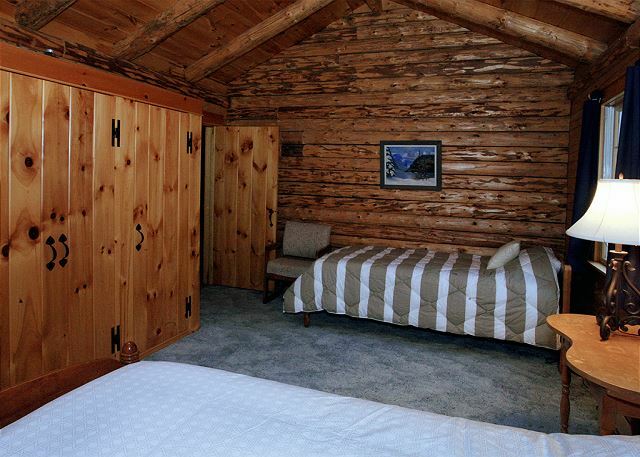 Sleeps 9, 4 bedrooms, 3 bathrooms. Dogs allowed. Walker's Grand View covered in Winter's white! 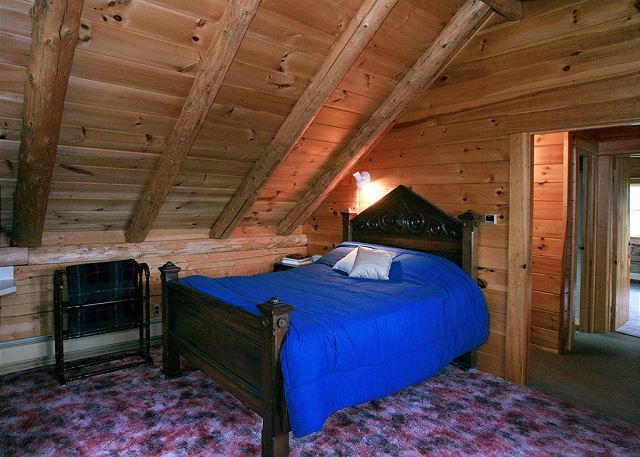 This 4 bedroom, 3 bathroom, sleeping 9 professionally managed vacation rental is sure to please! With wrap around deck, spacious yard, and 3 separate floors, there's plenty of room for everyone in your family or group! A view of the home from the lower part of the front lawn. Another view of the sitting area to the right, but now we see the entrance of the TV/living room to the left. Living room with large sectional sofa and doors leading to the deck. The almost wall size cut out between the family and sitting rooms give a more open feel to the living area, also allowing the warmth from the wood stove to flow through. You'll enjoy woodland and mountain views out most every window of the Walker's Grand View, especially here in the dining room. 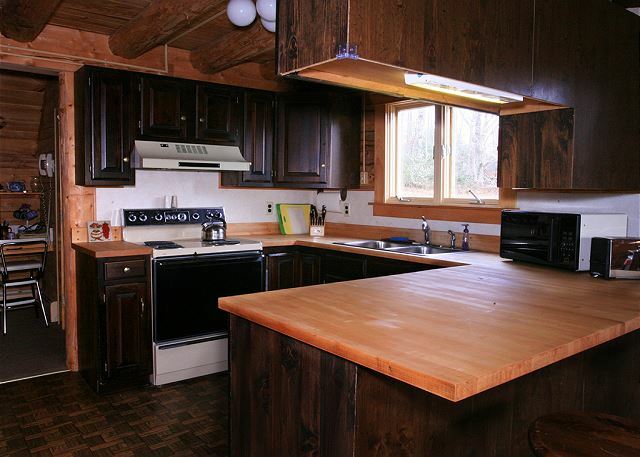 The kitchen, complete with newly done butcher block counter tops. 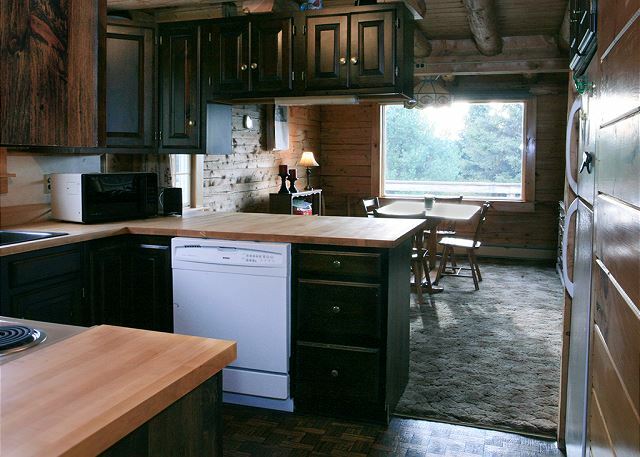 You'll find everything you need here to prepare an incredible meal in your cabin in the woods. A view looking through the kitchen, towards the dining area. 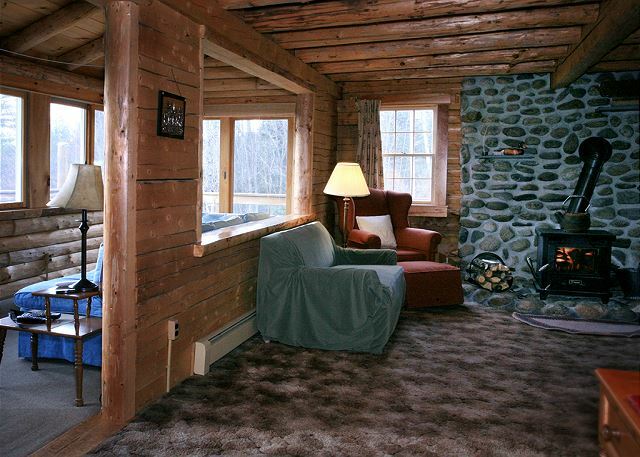 A Professionally Managed Franconia Notch Vacations Property, this log home enjoys a tranquil setting, yet you will only be minutes away from Franconia Town Center, Cannon Mountain Ski Area, Franconia Notch State Park, and all of the best of New Hampshire's White Mountains. 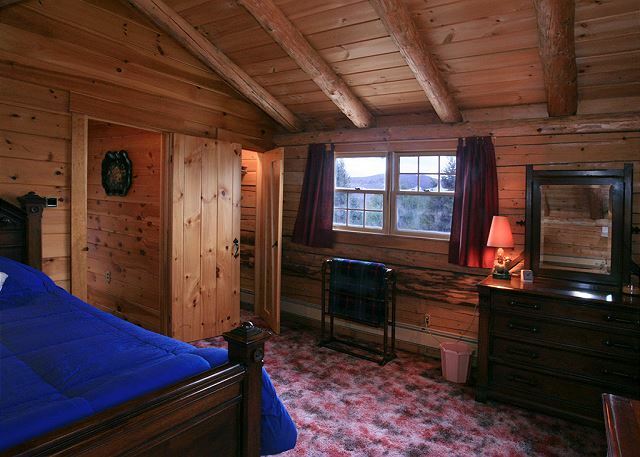 Nicely appointed with 4 queen bedrooms, and with 3 bathrooms there will be no waiting. 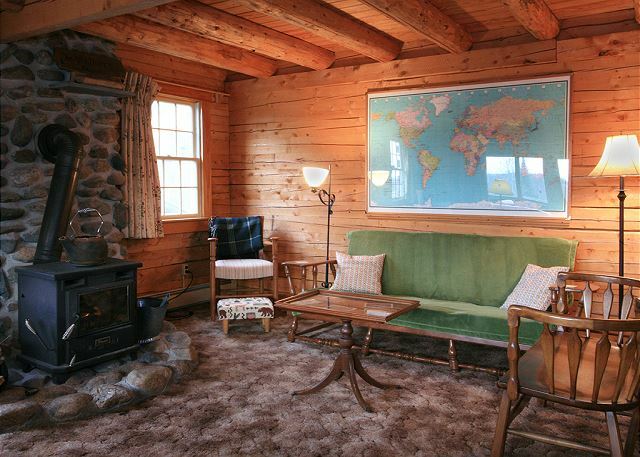 Enjoy all the comforts of home, maybe more! It's all waiting for you. Call and reserve your awesome vacation today! Great spot! lots of room, no neighbors...We had a wonderful stay. Two families (8 people). Minutes from Cannon, Polly's Pancake Parlor and Harman's cheese and country store. 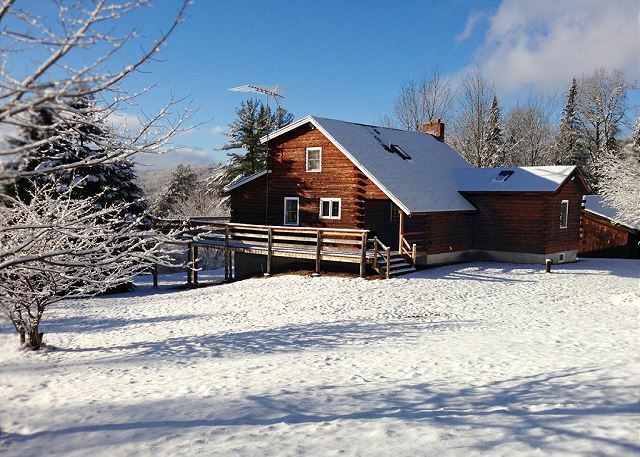 We rented this home so that we could all be together as a family for Christmas and the house worked beautifully. The kitchen was well equipped for cooking family meals and the house was comfortable, clean and warm (important because our daughter and son in law were flying up from south Florida). It was a great stay! In a word? Amazing. Myself and a group of friends stayed at Walker’s Grand View & enjoyed every minute of our stay. We wanted a relaxing peaceful getaway & that is exactly what we had. 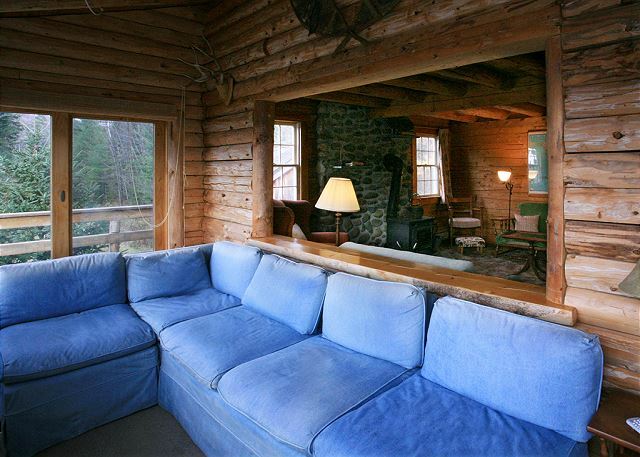 The location is so peaceful & serene, you’re sure to enjoy this beautiful rental. While it seems a bit off the beaten path, you really & truly aren’t a far car ride from anything you may need. The rental was clean, spacious, and all of the amenities we needed were there. From check in to check out Cort was extremely professional, courteous & helpful, even providing us with some pamphlets & area information to take along with us. You truly will not be disappointed with Walker’s Grand View - - our expectations were exceeded by far. The place was wonderful, great quiet location. Management is A+ M.r. Roussel is very polite and professional. 100% sure we will be staying there again!! 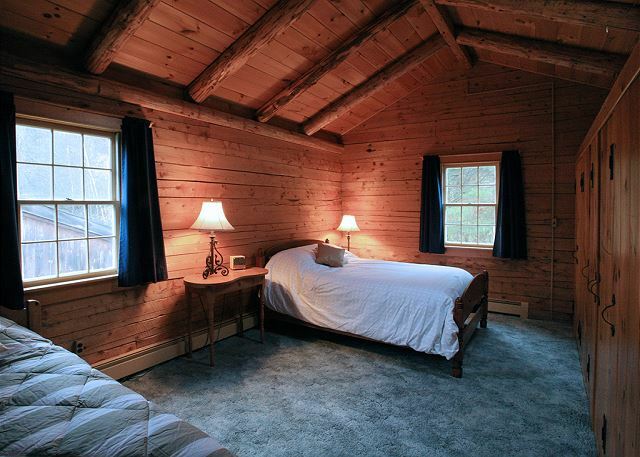 If you are looking for a quiet, tucked away, get away...this is the place you seek! 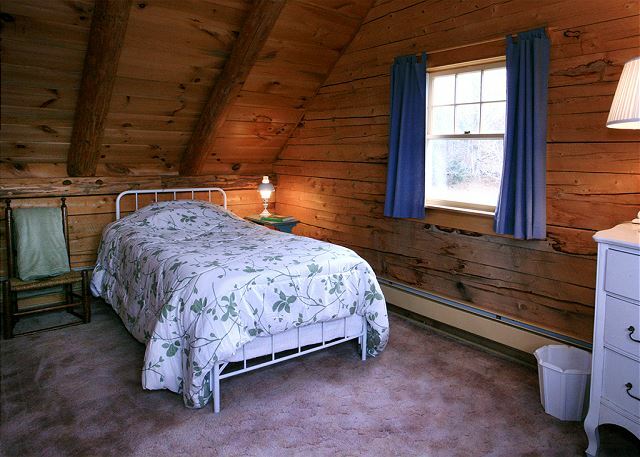 Located in the middle of the woods, you can find a serene spot for your stay in the Sugar Hill area. 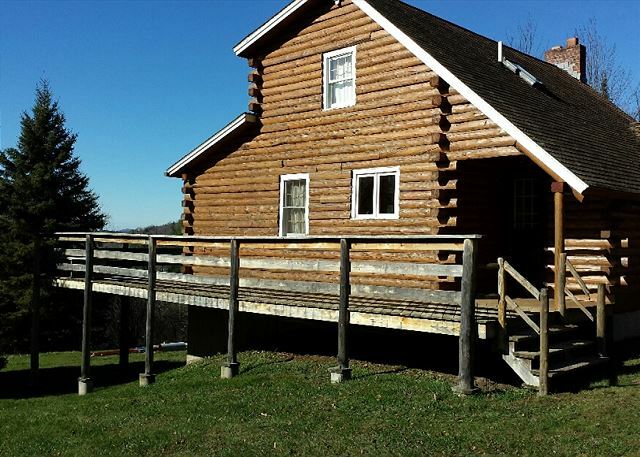 Thank you for your (almost) really great review on our Walker's Grand View Log Home, as we're glad to hear it worked well for your wedding event vacation trip. A tad warm for normal perhaps, yet what a great weekend it was! We really enjoyed staying at Walker's Grand View, and will definitely come back again. "And then...we smiled." Thank you for confirming & validating our efforts to create an enjoyable home & a greater vacation experience thru it, as it is our pleasure to serve and assist you with yours. Two families share Walkers Grand view. 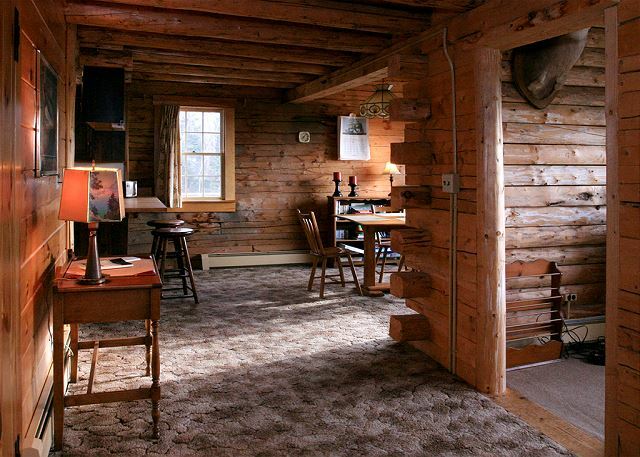 Rustic cabin in a secluded location in Sugar Hill. Great views in a private location. 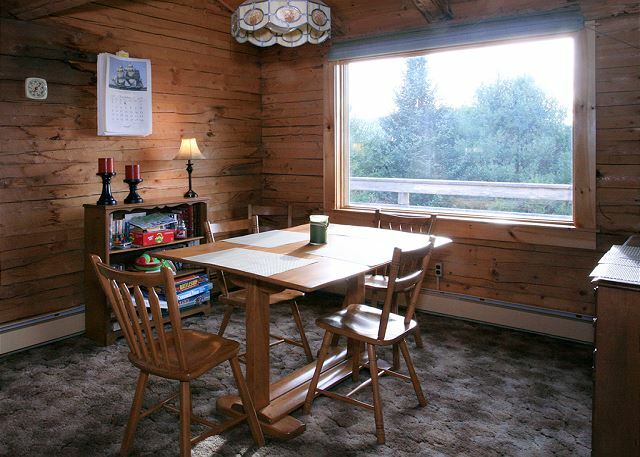 Plenty of room for both families (4 adults, 5 children). The house does not have a/c which was comfortable in the evening fan we provided in each bedroom but a little sticky in the late afternoon. There are a lot of steep stairs so if have young children in your group you'll need to watch them closely. Great deck and wonderful views as promised by the name. Stayed here with 7 friends over New Years. The house is incredibly clean and comfortable. Lovely views. Would stay here again. Plenty of room for all. 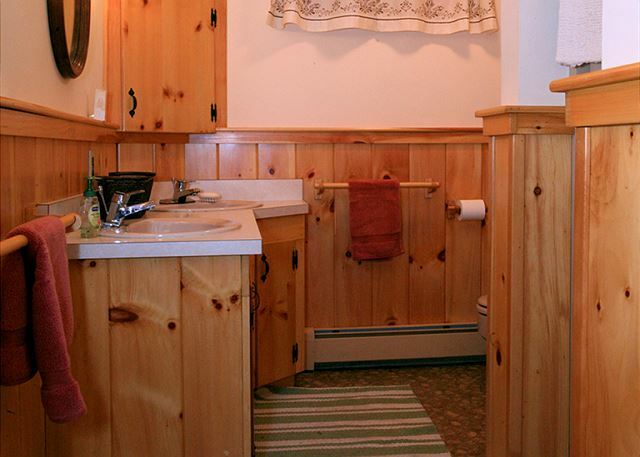 Three full bathrooms were very convenient as was the fully stocked kitchen. Only issue we encountered was mice. Darn those little non-rent paying rodents! Thank you for this comment Mr. Tourigny, as we do have a professional pied pipe that is always there to welcome our call for service. Now that we know where the music is needed, a concert shall be played. Future guests can be assured, their stay will be quietly enjoyed without such interruptions, with our regrets & apologize to the un-invited guests during this visit. 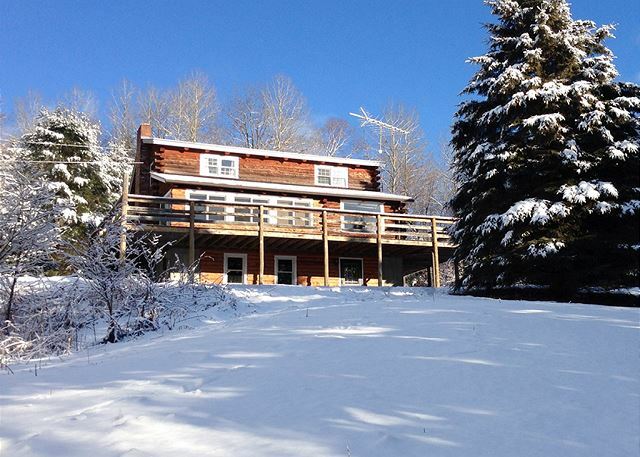 Two families (4 adults and 4 children) spent the long weekend in the house -- it was perfect!! 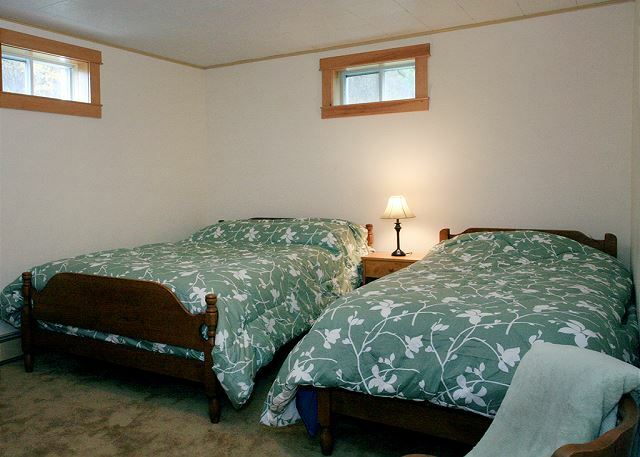 Lots of space, plenty of bathrooms and everything we could need to make our stay just like home. Close to several mountains -- we were at Cannon in a few minutes and Bretton Woods in under 1/2 an hour. Enjoyed the fire, all the board games and of course the great skiing nearby! It gave you a family feel. absolutely love it. The only thing is that the closet ski area is 8 miles which is not close but fine for us.